Among container carriers, liability is determined by the contract of carriage, usually the Bill of Lading that specifies the terms of delivery, the carrier's tariff, and by the applicable statutory law or international treaty. The terms of sale and transfer liability between the buyer and the seller for international goods are governed by Incoterms 2000. Incoterms are standard trade definitions that are commonly used in international sales contracts. They represent an international agreement that specifies responsibility and the transfer of goods between the buyer and the seller. The International Chamber of Commerce created Incoterms, or International Commercial Terms, in 1936. Currently there are 13 different Incoterms. In a Free On Board (FOB) transaction, the seller selects the freight forwarder to arrange for the movement of a container to the port or designated point of origin. This Incoterm is one of the most commonly misused terms as it is often incorrectly used to describe an inland movement. Correctly used, it applies to a cargo movement by sea or inland waterway. The responsibility is transferred from the seller to the buyer when the container is discharged at the port or designated point of origin. Neither the buyer nor the seller is responsible for insurance, although it is in the interest of the buyer to purchase insurance. In a Cost, Insurance and Freight (CIF) transaction, responsibility is transferred from the seller to the buyer once the container passes the ship's rail in the port of origin. The seller is responsible for any incidents occurring on the pier side of the rail, and the buyer is responsible for any mishaps occurring on the shipside of the rail. The seller is responsible for minimum insurance coverage. An Ex-Works (EXW) transaction is one of the simplest and basic shipping arrangements. The seller has minimum responsibility. He makes the container available for pickup at a stipulated place, usually the seller's factory or warehouse, at an agreed time. Delivery is accomplished when the container is released to the buyer's freight forwarder. The buyer is responsible for making arrangements with a freight forwarder to obtain export clearance and for handling all other paperwork. Under this type of transaction, neither party is responsible for insurance. It is, however, in the interest of the buyer to obtain insurance, because even before transportation the seller has discharged responsibility. When a shipper hands over cargo to a railroad, water container transport company, or trucking company, the container carrier issues a Bill of Lading. The Bill of Lading is a contract of carriage between the shipper and carrier, but also serves as a receipt for the cargo. It includes a statement of the cargo's value, charges for transport, and lists the carrier's conditions of carriage and liability. The Bill of Lading is also used as a document of ownership and can exchange hands several times during transit. The Uniform Intermodal Interchange Agreement (UIIA) is a standard industry contract among trucking, water, and rail container carriers. It was designed to bring uniformity to the interchange process, and to help inform the different container carriers about their rights and financial responsibilities when equipment is moved from one carrier to another. Currently, approximately 5,400 motor container carriers, 47 water container carriers, 6 railroads and one leasing company recognize the UIIA. The UIIA definitely helped to clear up liability issues. Previously, trucking container carriers felt that they assume liability when collecting documentation on their way out of the marine or rail terminal. In terms of the UIIA, it is clear that trucks assume responsibility for their actions once they enter a marine or rail terminal. According to the container leasing companies, the container lessee is responsible for tracking the container during the lease period. The lessors only arrange for the delivery and collection point at the beginning and end of the lease period. Many freight forwarders rely on the tracking systems of the ocean cargo carriers. 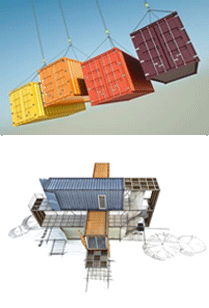 Others have internal systems that can track the containers from origin to destination. Most trucking companies track containers through an in-house dispatch system and telephone communication with the driver.